Two and a half years ago the late Eddie Jackson started a band. A big character with an even bigger heart, Eddie inspired his friends and others to take up instruments and start making music. The Stars Band has a real mix of personalities. Bassist Ben Lawrence dons the rocker look, long dark hair and black wristbands; lead guitarist Dale Smith is a thoughtful songwriter and loving mother; backing vocalist Micheal Hambrey, an accomplished DJ, occasionally scraps with other band members in clashes of artistic difference. Most of the musicians started from scratch in the last three years. They meet every Friday to practice, learning from each other and their music teachers, Mooney Wainwright and Chris Morris. And this Thursday they will launch their debut album, We Think Differently, at a gig at the Leadmill, Sheffield. But this is no ordinary band. 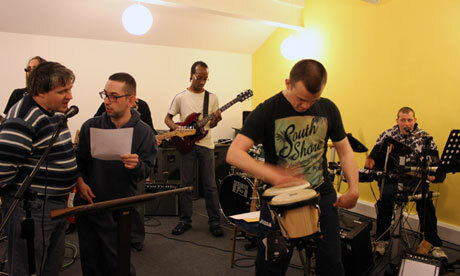 Though with more than 13 members the Stars Band is larger than your average music group, something else sets them apart: everyone in the band has learning difficulties. The Stars Band is an offshoot of Under the Stars – a club night run since 2007 by and for adults with learning disabilities and their friends in Sheffield, Rotherham and Doncaster. Disabled people organise and run them and DJ on nights that attract up to 550 people. Under the Stars is a social enterprise; disabled people pay to attend workshops out of their disability care budgets from the council. 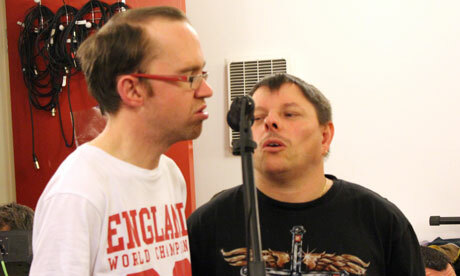 In collaboration with Musical Works, an arts education agency, Under the Stars rent a music studio on Burton Street, Sheffield, where people with learning difficulties can learn to sing, DJ or play an instrument. Three bands have sprung up: the longest-running, the Stars Band; a ska/rock band called Clubland Detectives; and the recently formed all-girl band Sparkle Sistaz. The band members have varying levels of ability and communication, but even the shyest and least physically and mentally capable have progressed hugely over the past two and a half years. Ben Lawrence could hardly dress himself when he joined the Stars Band, and now he’s a skilled bassist. For keyboardist Andrew Hartley even being able to hit the right two keys on the right beats is an accomplishment his teachers are amazed he has been able to achieve. Dale Smith, 49, was diagnosed with Asperger’s syndrome just eight years ago. She said she didn’t have many interests before she joined the band but now can’t wait to get started on the second album. “I’m more able to express myself in music. It’s just you don’t have to use a lot of words – you don’t need a lot of words. The band has caught the attention of music industry heavyweights like Radio One DJ Toddla T and Sheffield-based film production company Warp Films, which will premiere the highly anticipated documentary on the return of the Stone Roses this Thursday. Their sponsorship has made it possible to launch the ten-track album, written by members of the band and including a cover version of Radiohead’s Creep. It will be available to download from iTunes on 30 May. There are also 1,000 physical copies of the CD, designed and printed for free by Peter and Paul, a Sheffield design company. There are 13 individual album covers: each one portrays a different member of the band, with an ethereal pattern designed to reflect the electrical impulses of the mind. via The Stars Band: ‘why shouldn’t disabled people have a great album cover?’ | UK news | guardian.co.uk.